Hospital‐acquired venous thromboembolism (HA VTE) is a common source of morbidity/mortality. Proven prophylactic methods are underutilized. Available risk assessment models are not prospectively validated. Participants in the study were adult inpatients on all services (excluding OB/Psych) of a 325‐bed university hospital. IRB approval was obtained. We built consensus for a simple 3‐tier VTE risk assessment model from mid‐2005 to mid‐2006 and then integrated it into a VTE prevention protocol and computerized provider order entry (CPOE) orders. Each level of VTE risk was linked to optimal prophylaxis options. We adjusted the order set based on active monitoring and implemented real‐time identification and intervention for nonadherents to the protocol via nursing/ pharmacy in 2007. The risk assessment model was tested for inter‐ observer agreement on 150 patients with 5 observers. Random sample audits of inpatients in the medical center > 48 hours were performed throughout the study period. The percentage of patients on “adequate” VTE prevention regimens was tracked. We identified VTE cases concurrently with our digital imaging system. Case review classified each VTE event as hospital or community acquired. 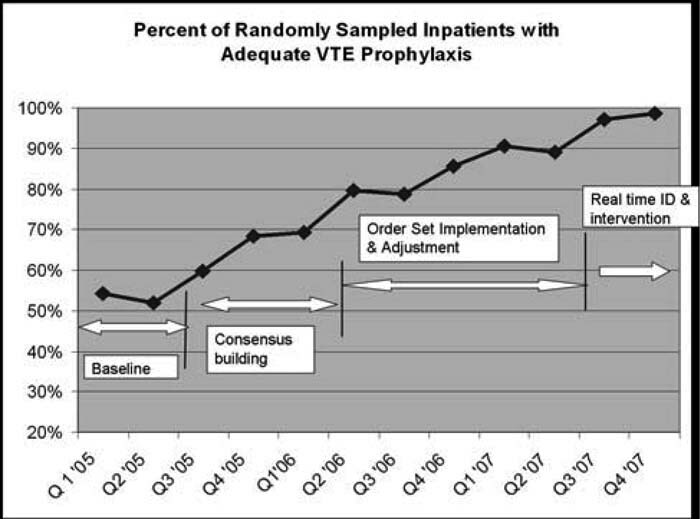 HA VTE cases were classified as “preventable” if they developed their VTE when on suboptimal prophylaxis per protocol. Comparisons were made over study years with the chi‐square statistic. Excellent interobserver agreement was achieved for VTE risk level (kappa score 0.8) and for the judgment of “adequate” prophylaxis (kappa > 0.9). The percentage of patients on adequate prophylaxis improved in each calendar year (67%, 76%, 92%; P < .001) and reached 98% in the last 6 months of 2007 (Fig. 1). We identified 730 cases with VTE, 345 of which were HA VTE cases (47%). HA VTE cases and preventable HA VTE cases were reduced in 2007 compared with 2005‐2006 (Table 1). HA pulmonary emboli were reduced by more than 50%. The distribution of VTE risk was stable, whereas the population of patients/patient‐days rose slightly over the study years. We detected no increase in HIT or bleeding events via administrative data/chart review. Figure 1. A total of 2894 audits (mean, 242 audits/quarter) of randomly ;ampled adult inpatients with a LOS > 48 hours. We prospectively validated a VTE prevention protocol by demonstrating ease of use, good interobserver agreement, and effectiveness. Improved VTE prophylaxis resulted in a substantial reduction in HA PE and DVT. G. Maynard, sanofi aventis, speaking honoraria; I. Jenkins, none; S. Stone, none; J. Lee, none; E. Fink, none; T. Morris, none; R. Schoenhaus, none; M. Renvall, none. Maynard G, Jenkins I, Stone S, Lee J, Fink E, Morris T, Schoenhaus R, Renvall M. Prevention of Hospital‐Acquired Venous Thromboembolism: Prospective Validation of a VTE Risk Assessment Model and Protocol. Abstract published at Hospital Medicine 2008, April 3-5, San Diego, Calif. Abstract 52. Journal of Hospital Medicine. 2008; 3 (suppl 1). https://www.shmabstracts.com/abstract/prevention-of-hospitalacquired-venous-thromboembolism-prospective-validation-of-a-vte-risk-assessment-model-and-protocol/. Accessed April 26, 2019.